There was one big looming question heading into this week’s Raw: what would WWE do about Roman Reigns’ suspension? The day after Raw aired last week it was announced that Reigns had violated WWE’s wellness policy and had been suspended for 30 days. As many noted, that left him free to come back at Battleground and compete in the scheduled Triple Threat match, and further reports suggested that WWE knew about the violation prior to Raw, when the match itself was made. So, would WWE nuke the main event or just roll with it? As it turns out, WWE’s plan is to just take things in stride and face the violation head-on. Not only does Seth Rollins start the show by going straight at Reigns and his “mistake,” AJ Styles and John Cena come out to agree with Rollins’ assertion that Reigns should be removed from the match, and they think they should be put in his spot. That settles that question. More than just serving as a way of working Reigns’ real-life violation into the story, it signals one of the night’s major themes, one of the things WWE gets right: balancing separate storylines and making them work together. More often than not it feels like every feud within WWE operates in a vacuum. That means that if Sheamus and Apollo Crews are feuding nobody else really gets involved. Or, if Titus O’Neil and Rusev are feuding, Darren Young and all of Rusev’s previous opponents are absent and not worthy of being mentioned. WWE has a tendency to actively ignore its recent past, as if a PPV match suddenly settles everything. The intended effect is to provide clarity from one feud to the next, but the opposite happens. It makes it look like nothing matters, like nothing is interconnected, like these guys and girls don’t share buses and locker rooms, despising and loving one another all at the same time. Like I said though, this Raw does a good job of interweaving and balancing storylines, and that makes the entire show all the more compelling. Let’s start with the Women’s Division. The first match of the night sees Paige and Sasha Bank square off against Charlotte and Dana Brooke. It’s a decent match, even as Dana remains green as can be, up until Sasha gets the hot tag…then it becomes great. There’s no joking around, no room for Dana to “get her stuff in.” Instead, Sasha looks fierce, demolishing Brooke and snagging the win for her team. Then, a bit later, Becky comes out to have a match with Summer while Natalya sits in on commentary, but the match never gets started because Becky goes straight for the woman behind the table who got a jump on her two nights in a row. It’s a short segment, but when taken with the previous Women’s segment, it’s promising. It’s WWE showing they can handle two Women’s stories at once, and not one of them is about being jealous or catty or whatever other sexist nonsense WWE has pulled over the years. It’s not enough, but it’s progress. That deft handling of feuds makes the main event scene something to believe in right now. To some extent, there are multiple wrestlers with a claim to being in contention for the WWE World Heavyweight Championship; or, as they refer to it tonight, the “WWE Championship,” which could be a sign of something fishy happening with the brand split. Cena, Styles, Reigns, and Rollins all deserve to be in that spot, and Ambrose deserves the title because he won it fair and square based on the MITB stipulation. That’s a crowded field for WWE, but it’s the type of crowded that breeds excitement. There are endless possibilities in these various allegiances and motivations, and while tonight mostly sticks to the script—both AJ and Cena don’t get their spots in the Battleground title match—it’s WWE showing that they can tell multiple stories all at once. So, The Club coming out to ruin Cena’s match isn’t particularly surprising, but the fact that it happens within the context of Cena looking for a Championship match makes it fresh and exciting, and the same can be said when Cena comes out and causes chaos during the main event. 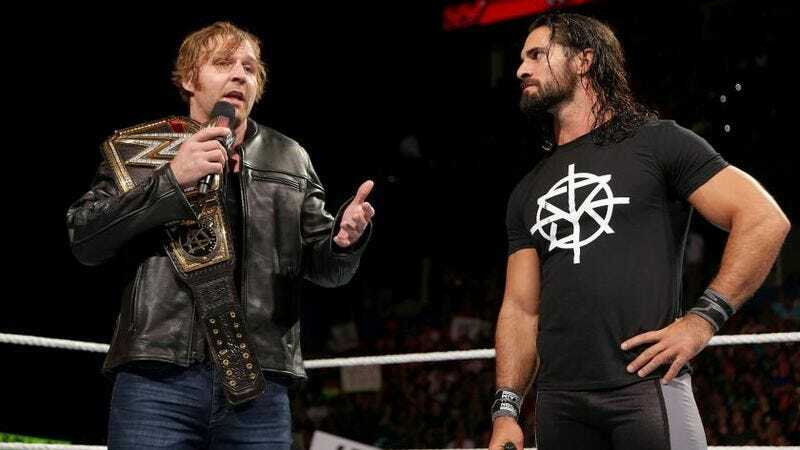 The match between Ambrose and Styles is great on its own, but when you add in the post-match craziness, from The Club beating down Cena to Rollins getting the jump on the champ with two Pedigrees, you have to be excited about how WWE is building up its main event talent. Now, that doesn’t mean the show doesn’t sag at time, or suffer from some weird logic. First, there’s the fact that Stephanie McMahon has no consistent character. For weeks she’s been the equal of her brother Shane in temperament and action, but here she’s evil once again, going off on Ambrose and saying that it’s a disgrace that he’s champion. The fact that WWE pivots her character so sharply is inexcusable, even if it’s with a brand split in mind. Then there’s the absolutely baffling decision to tease a mystery opponent for a returning Miz and his Intercontinental Championship defense, only to have his opponent be Kane. It’s a point I made last week, but it applies here too: WWE has a depth of phenomenal talent that they should be showing off going into the brand split. Kane is not a part of that group. He’s fine as a backstage guy in his corporate gear, but he’s certainly not needed in the ring when you can put literally anyone else I that spot. Take a lesson from the energy and freshness of the Social Outcasts being on TV and give that hot spot to someone else, someone who deserves to see a little spotlight and can maybe run with it for awhile. Those underwhelming moments don’t derail Raw though. Ultimately, tonight’s show does what just about every Raw should do. It pushes multiple stories forward at the same time through segments and good wrestling. It acknowledges that these stories intersect from time to time, and that these superstars can be mad at or aligned with more than one person at once. Those layers matter. The layers are why the Zayn-Owens feud feels like it has endless possibilities, even when they’re just talking, and why Rollins can cheer for Ambrose during the main event, and why Xavier Woods seems drawn to Bray Wyatt and his cause. A little depth and nuance every now and then would do WWE some good. Results: Sasha Banks and Paige defeated Charlotte and Dana Brooke; Titus O’Neil defeated Rusev via countout; Seth Rollins defeated John Cena; Enzo and Cass defeated Local Jobbers; Kane defeated The Miz (c) via countout (Intercontinental Championship match); Cesaro and Apollo Crews defeated Sheamus and Alberto Del Rio; Dean Ambrose defeated AJ Styles. Where do we all stand on that Social Outcasts/Enzo and Cass bit? It was just the right amount of childish for me. Rusev and Titus are doing everything they can with their feud, but nobody seems into it. There’s some crowd noise here and there, but that’s about it. Can we just get Darren Young back in the ring please? That CWC commercial has me HYPED. WWE giving a guest spot shoutout to Jameis Winston was legitimately disgusting. Maryse and Miz’s bonding over cheating and acting is perfect. We see you Nattie, pulling out the Owen Hart promos. Every time Rollins does the flip into the corner powerbomb I cringe.